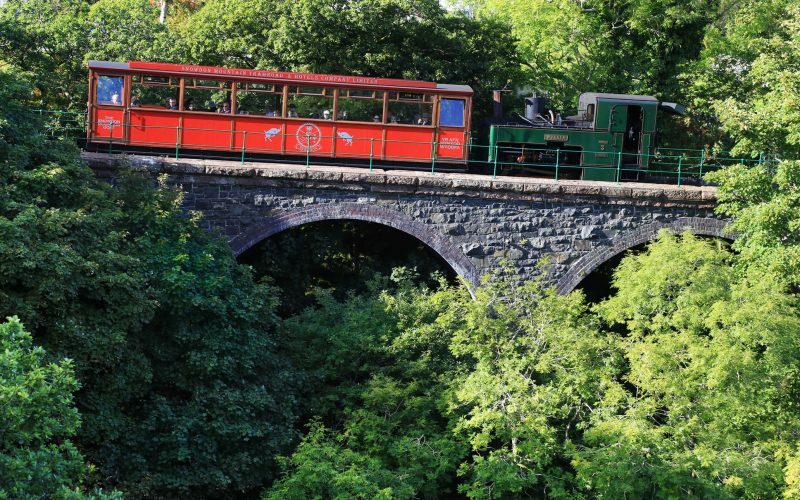 Soon after you leave the station in Llanberis, the train crosses the first of two viaducts across the Afon Hwch river, where the Ceunant Mawr waterfall plunges majestically into the gorge below. You’ll then pass by Waterfall station; the building here was originally a cottage residence once occupied by a local family. 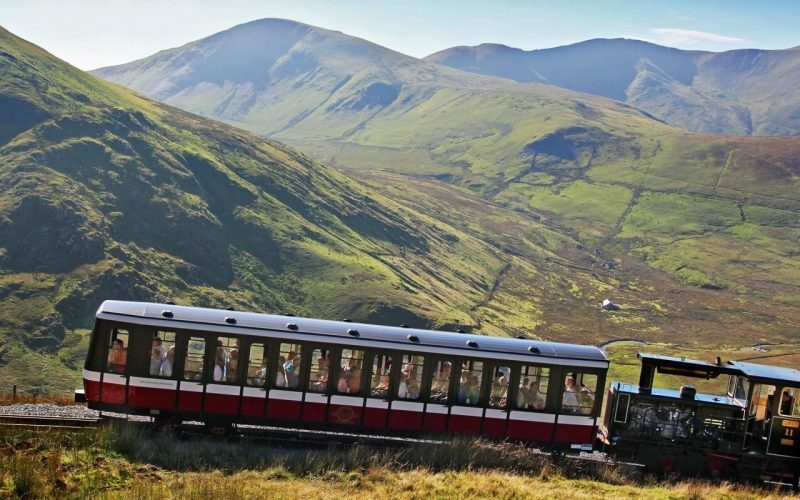 As the train emerges into the open, treeless countryside, you’ll catch a first glimpse of the Summit of Snowdon as it pokes above the ridge ahead to the right. Moel Elio, named after a 4th Century Irish king, can be seen rising on the right of the track. All around, the landscape is dotted with abandoned, simple, thick-walled dwellings that once housed local families. The train next passes Hebron Station, named after the nearby Hebron Chapel. 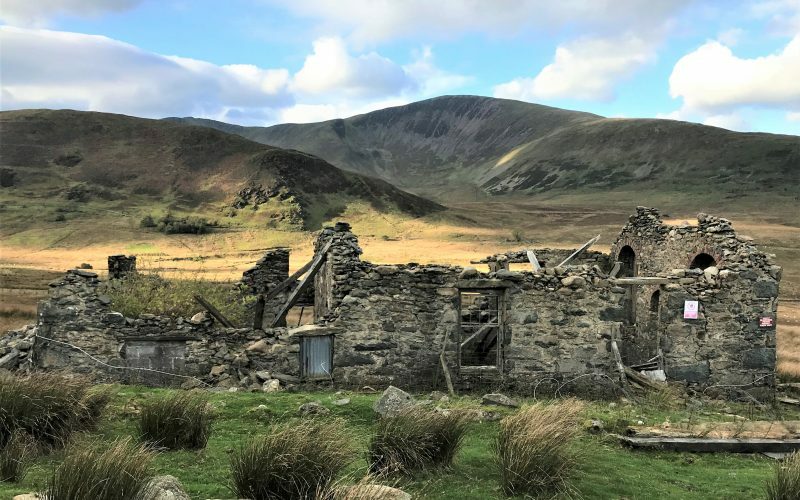 In 1833 the poor families in this valley joined together and, from the pittances they scraped from the slate quarries and from the land, raised enough money to build themselves a chapel. This would become their spiritual and cultural centre and was still habitable in 1966 when it was bought for just £450. Nature has now become its final tenant but its name lives on, however, in the name of the station here: Hebron. To the right the large, ruined farm of Helfa nestles at the bottom of Cwm Brwynog, or Valley of Reeds. No one knows its real history. It might have once been a place for herding sheep or a hunting lodge – hunting wild boar was once common in the area. 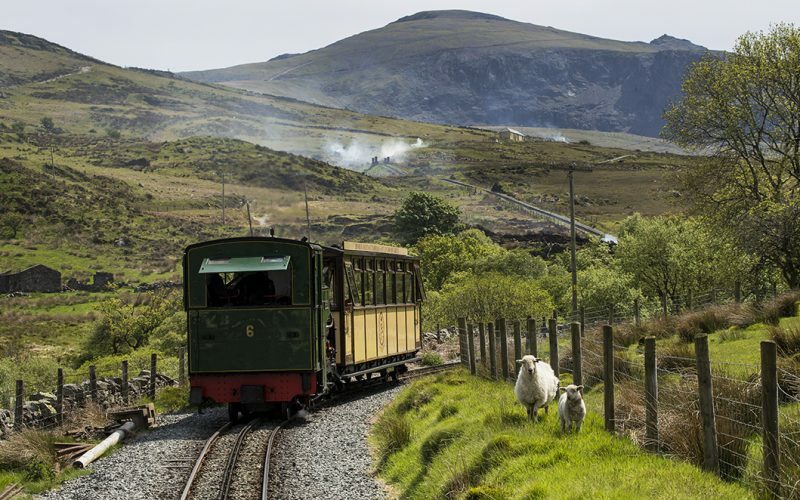 As the train climbs higher Moel Hebog can be seen in the distant, rising above the village of Beddgelert. It means Hill of the Falcon and is one of the many Snowdonian homes of the Peregrine Falcon, the world’s fastest animal. 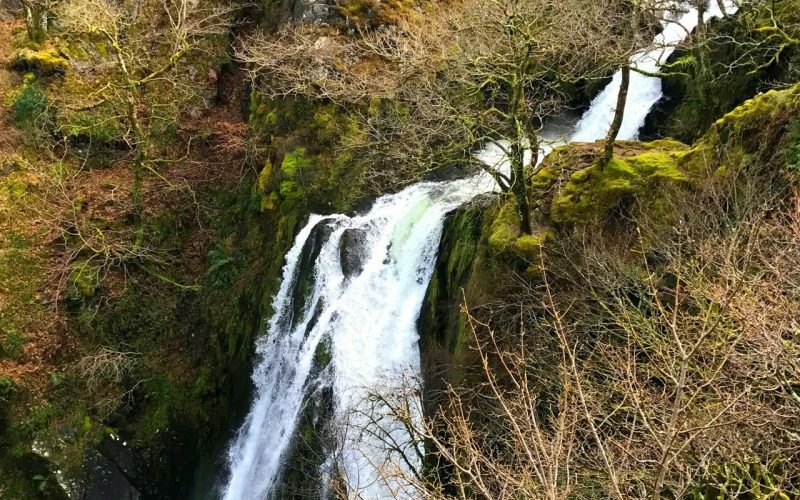 To its north is a cave where it is believed that Owain Glyndwr, the leader of the last Welsh rebellion against the English, lies waiting to rise and lead his people once more. 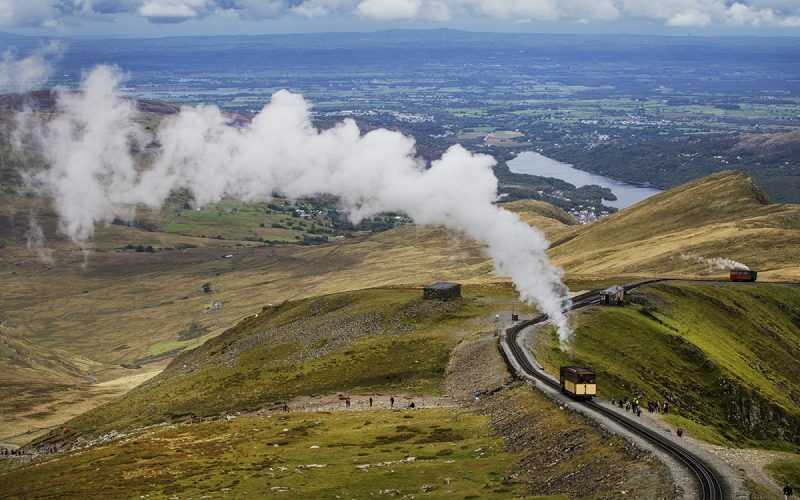 Halfway Station is where the steam engines stop to re-fill their water tanks, ready for the final ascent. The original halfway hut before it blew down in a gale. It was famous for its lemonade made to a secret recipe, which presumably blew away in the wind as well. From here you can see the walkers down on the Llanberis Path to the right, and Moel Cynghorion – the Mountain of Councillors – rises on the far side of the valley. 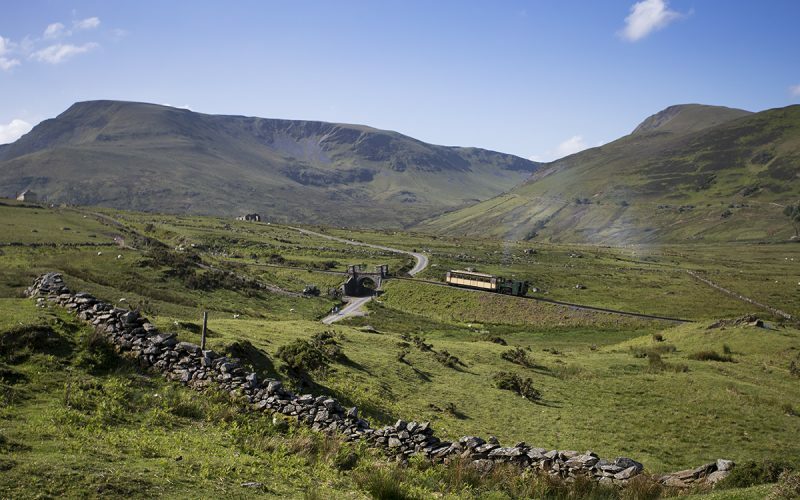 Beyond the Halfway Café are remnants of one of the largest medieval settlements in Wales, and the black volcanic rock face of Clogwyn du’r Arddu rises in the distance. 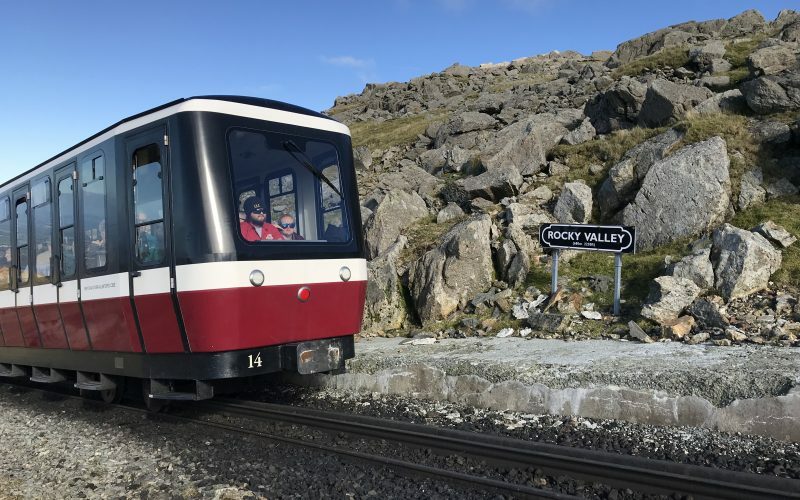 As the train leaves Halfway Station and the lush green valley below it approaches the dramatic, sheer edge of Rocky Valley, a rock-littered landscape with spectacular views to the valleys below. 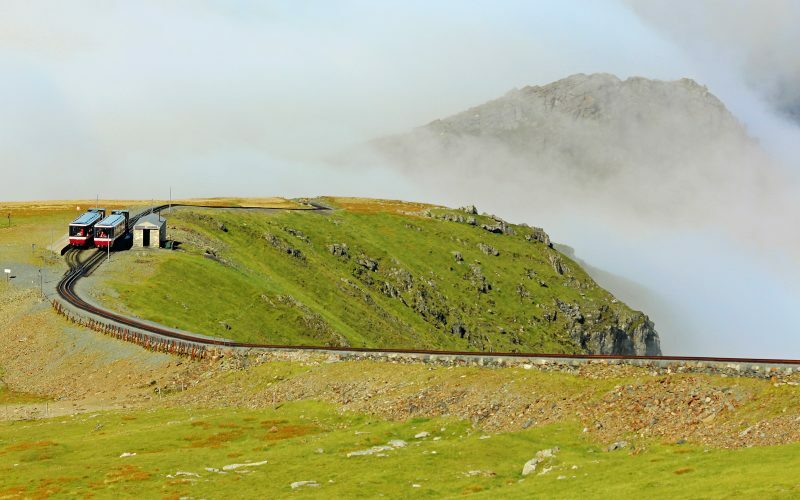 Cars can be spotted like small ants down on the Llanberis Pass to the left, and to the right, views of the Llyn Peninsula become visible in the distance through the valley. 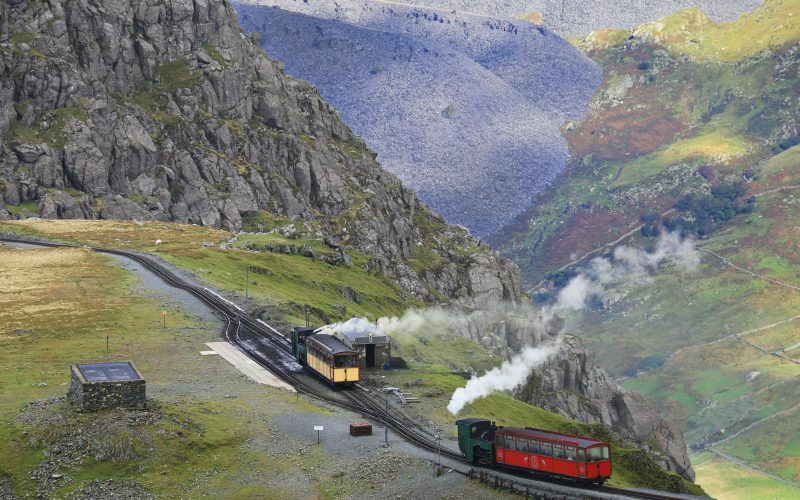 Clogwyn Station is as high as the trains can go in early spring, when ice or snow prevent trains from reaching the Summit. 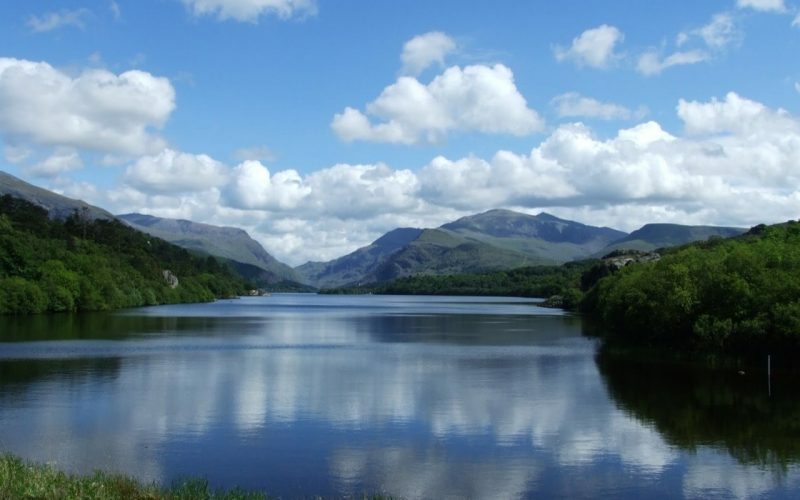 Located on an exposed ridge, overlooking Llanberis Pass and Clogwyn Du’r Arddu cliffs. Nearby lies a group of huge boulders that once tumbled from cliffs above and are rumoured to be the home of a witch named Canthrig Bwt who would try to catch children climbing on the rocks. 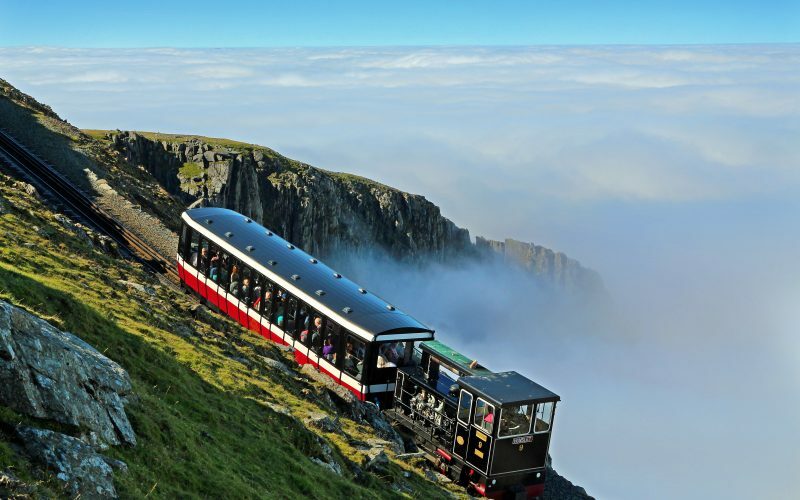 One of the world’s greatest panoramas is revealed on arrival at the summit. 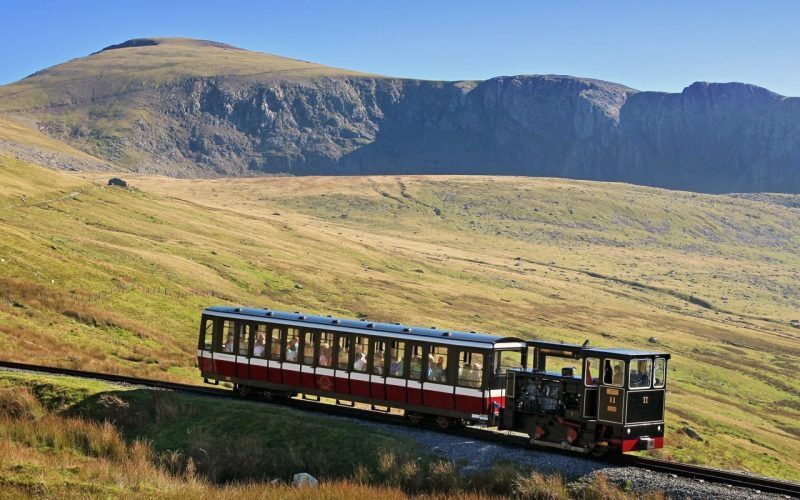 Hafod Eryri, the UK’s highest visitor centre, has spectacular panoramic views to the valleys below. From here you can venture to the cairn, where on a clear day the views stretch out as far as Ireland. 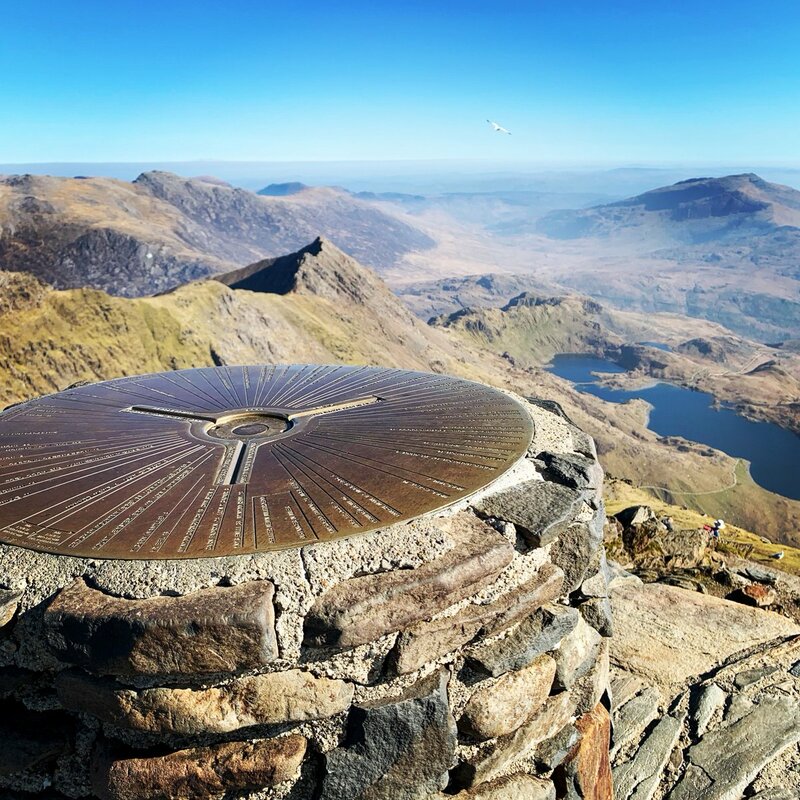 Standing on the summit of the highest Mountain in Wales and England, young and old can embrace the invigorating atmosphere of Eryri – Land of the Eagles. 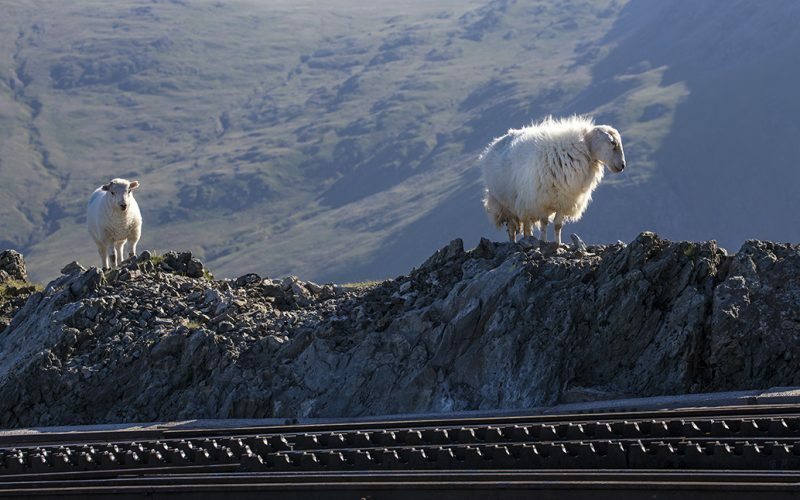 Around 20% of the Snowdonia National Park is specially protected by UK and European law, which helps to conserve the animals and plants found on Snowdon. A charming and delicate Alpine flower, the Snowdon lily is known as brwynddail y mynydd, which means ‘rush-leaves of the mountain’. Snowdonia is home to many Arctic Alpine plants. 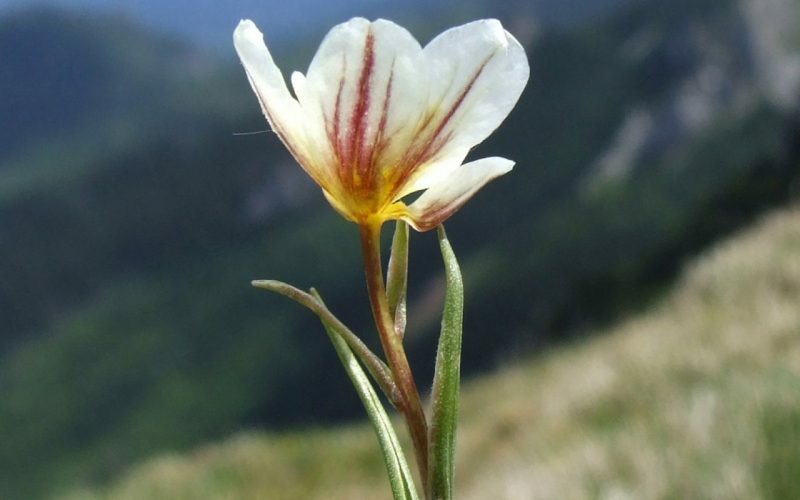 These include Alpine meadow-grass, tufted saxifrage, Alpine saxifrage, Alpine woodsia and Alpine cinquefoil. Birds frequently spotted in the area include the peregrine falcon, meadow pipit, wheatear, raven and ring ouzel. 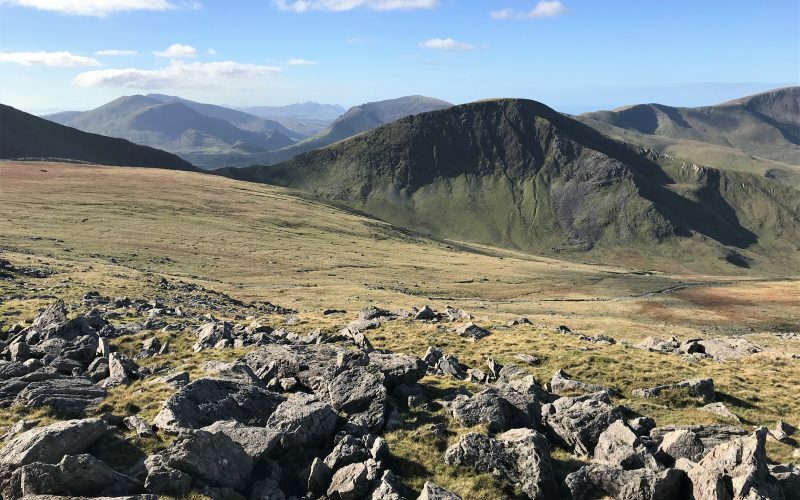 Snowdonia is also the UK’s main population centre for chough, a rare member of the crow family, instantly recognisable to the seasoned bird watcher because of its distinctive vocalisations and red beak. Mammals living on the mountain include feral goats, otters and polecats. It is also thought that pine martens still live in the area, with sightings reported periodically. 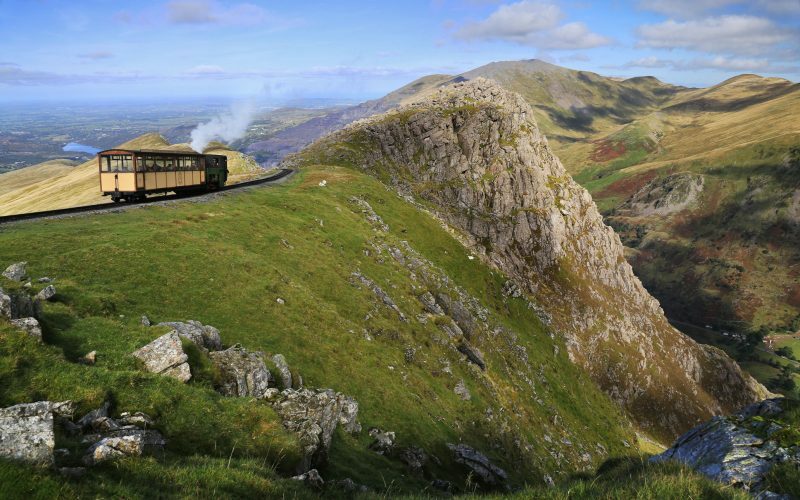 If you do visit Snowdonia, make sure you keep a watchful eye out for the Snowdon beetle – also known as the rainbow leaf beetle. The entire adult population is thought to amount to just 1,000, so if you do get to see one consider yourself very lucky.